What did the president decide on Iran? President Trump officially announced on Tuesday that the U.S. intends to no longer participate in the 2015 internationally-accepted Iran nuclear deal, formally known as the Joint Comprehensive Plan of Action (JCPOA), and will now re-impose sanctions against Iran. "The U.S. will withdraw from the Iran nuclear deal," Mr. Trump announced from the Diplomatic Room of the White House. 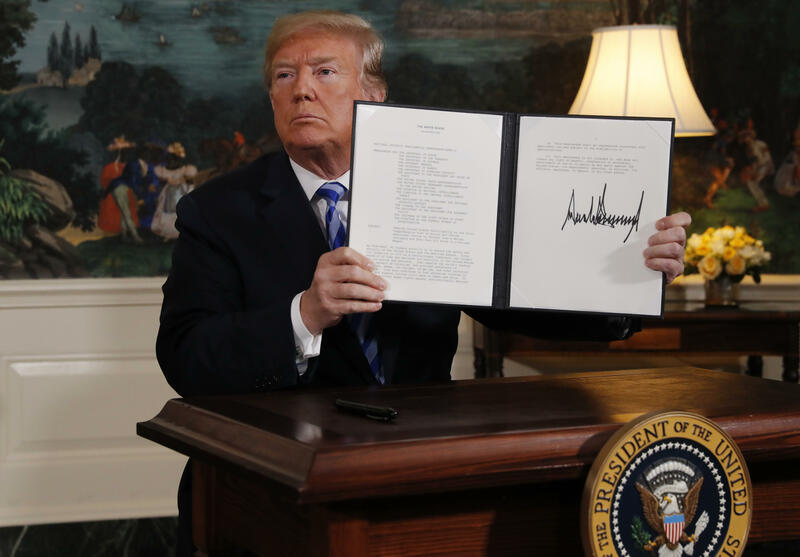 Signing a presidential memorandum, the president reinstated U.S. nuclear sanctions on the Iranian regime, jumpstarting the "highest level of economic sanctions." "If the regime continues its nuclear aspirations, it will have bigger problems than it has ever had before," Mr. Trump warned. He added that any nation that helps Iran in its "quest for nuclear weapons" could also be sanctioned by the U.S.
"America will not be held hostage to nuclear blackmail," Mr. Trump said, adding that his move on Tuesday "sends a critical message that the U.S. no longer makes empty threats." His announcement on Tuesday comes just days before the May 12 deadline to decide to renew the sanctions waiver. In his announcement, Mr. Trump said that upon exiting the Iran deal, the U.S. will now continue to work with international allies to "find a real comprehensive and lasting solution to the Iranian nuclear threat." He said that this plan will include efforts to eliminate the threat of Iran's ballistic missile program, cease its terrorist activities around the world and block Iran's "menacing" regional activity across the Middle East. Such a solution mirrors some of the proposals included in French President Emmanuel Macron's alternative Iran deal, which he raised with Mr. Trump during his recent visit to Washington. Meanwhile, despite the president's implication that sanctions go back into effect right away, the Treasury Department says that there will be the grace period for winding down business operations with Iran. CBS News' Margaret Brennan reports that European allies were told last Friday by Secretary of State Mike Pompeo that they'd be granted that grace period. The Treasury Department's Office of Foreign Assets Control will reimpose sanctions "subject to certain 90 day and 180 day wind-down periods." Following the conclusion of the wind-down period, applicable sanctions will be in full effect. In a background briefing after the president's speech, national security adviser John Bolton explained that the wind-down provisions will "give business a chance to get out" but that no new contracts would be permitted when the sanctions are implemented. In a Tuesday statement, Treasury Secretary Steve Mnuchin said the "United States will cut off the IRGC's (Iran's Revolutionary Guard Corps) access to capital to fund Iranian malign activity, including its status as the world's largest state sponsor of terror, its use of ballistic missiles against our allies, its support for the brutal Assad regime in Syria, its human rights violations against its own people, and its abuses of the international financial system." Bolton said that it was "entirely possible that additional sanctions will follow as new information comes to light and that is something that we should pursue vigorously because we want to put as much economic pressure on Iran as we can and deny them the revenues that they would have gotten from the transactions that re not eliminated." While the Iranian government has sent mixed messages about how it would respond to the U.S. decision, Iranian President Hassan Rouhani said in a televised message after Mr. Trump's speech that Iran would be willing to remain a part of the deal without U.S. involvement, subject to negotiations with the remaining international partners. It's a move that Europeans have been pushing for as of late. "If at the end of this short period, we've concluded that we are able to achieve our demands in the deal, the deal will survive," Rouhani said. Rouhani warned, however, that he has ordered the Atomic Energy Organization of Iran to be prepared to potentially restart uranium enrichment at industrial levels. This falls in line with what Foreign Minister Zarif previously told CBS News' "Face the Nation," which is that Iran could relaunch its nuclear program at a faster speed if the U.S. left the deal. With a U.S. withdrawal, Iran can now claim that Washington was the first to violate the deal and could resume fuel production. But experts point out that it is not in Iran's best economic interest to pull out of the deal. Although the country's inflation is very high, their economy grew more than 12 percent in 2016 and then leveled off at about 4 percent in 2017. Following the president's announcement, President Macron tweeted that France, along with the UK and Germany, deeply regretted "the U.S. decision to leave the JCPOA." "The nuclear non-proliferation regime is at stake," Macron warned. The three leaders later released a joint statement, reemphasizing their commitment to the JCPOA and urging the international partners to "seek a positive way forward." "We urge the US to ensure that the structures of the JCPoA can remain intact, and to avoid taking action which obstructs its full implementation by all other parties to the deal. After engaging with the U.S. Administration in a thorough manner over the past months, we call on the U.S. to do everything possible to preserve the gains for nuclear non-proliferation brought about by the JCPoA, by allowing for a continued enforcement of its main elements." Who will oil sanctions impact? Iran now produces about 3.8 million barrels a day of oil and exports about 2 million barrels of oil per day. China is the biggest importer of Iranian oil followed by India, Japan, South Korea and Turkey. In the past, Asian countries have worked with the U.S. to get their oil from other places, but now countries like China are expected to be "very reluctant" to accommodate U.S. sanctions, says Bob Einhorn, an expert at the Brookings Institute who was previously at the State Deparment and worked on the Iran deal. Einhorn says that these countries now have workarounds they can use, such as using a bank that is already under U.S. sanctions, to be the facilitator of oil purchases from Iran. Saudi Arabia could come in and fill some of the void -- as they have done in the past -- but it is unclear if they will be willing to do that. Oil prices just hit a 3-year high and Saudi Arabia does not have a big interest in seeing those prices go down, especially given the upcoming initial public offering for Aramco, the Saudi oil giant. There are other countries that could also step in, such as Iraq, Kuwait and Russia. OPEC, an association of 14 petroleum-producing states that includes Iraq and Kuwait, will also have to decide whether to abandon its current "freeze" strategy in order to increase supply. What do nuclear inspections in Iran look like as of now? Europeans argue that the inspections are robust: there were over 400 site inspections, and 25 snap inspections in the course of the first year of the deal. Critics of the deal say that there is a problem because the military sites cannot be inspected. Inspections are carried out by the International Atomic Energy Agency (IAEA). The IAEA's director general has defended the verification regime -- calling it the "most robust" anywhere in the world and saying that military sites are not off-limits. But inspectors must request access to military sites and approval can take up to 24 days. CBS News' Kylie Atwood, Margaret Brennan and Emily Tillett contributed to this report.